Archie Benn was not quite a maverick senator but he was a man of independent mind who survived three full terms in the Senate very much on his own terms, pursuing subjects that had occupied him through his earlier career as an industrial officer in the Queensland Public Service, and developing his interests in international relations. Though closely involved in the turbulent split of the Queensland branch of the Australian Labor Party during his years as a senator, he made no reference to those events in the Senate, where he pursued his own resolute course, remaining somewhat aloof from his colleagues, including those on his own side. Benn’s ascent into politics began with his election as a union organiser for the Australian Workers’ Union (AWU) in the south-western district, centred on Toowoomba, in December 1921. He had made an unsuccessful attempt two years earlier. In January 1924 with AWU support and with a letter of recommendation from Frank T. Brennan, then MLA for Toowoomba in the Queensland Parliament, he entered the Queensland Public Service as an inspector of factories and shops in the Department of Public Works. He worked in Toowoomba, Brisbane and Innisfail, and was sometimes described as a labour agent and industrial inspector. At various times he was a returning officer and chairman of the apprenticeship advisory committee in Toowoomba. 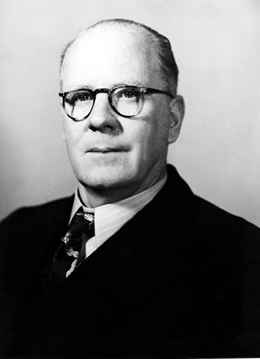 Benn had his supporters, including William Forgan Smith, Premier of Queensland, 1932–42, and Joe Bukowski, controversial AWU chief in Queensland in the early postwar period, both of whom recommended him for preferment in the public service. Thus Benn was, on his own account, transferred to Innisfail in 1933 at the direction of the Cabinet, ‘because of the trouble caused by communists’ in the district. Then, ‘by the direction of the Minister’, he was sent for a month to Mount Isa ‘to handle the ration system during the miners’ strike’. In June 1934 he applied unsuccessfully for the position of director of labour and chief inspector of factories and shops, several rungs above his level at that time. He returned to Brisbane in August and resumed his way up the hierarchy of the department, becoming deputy chief inspector in February 1940. From June 1943 he acted as director of labour, chief inspector of workers’ accommodation, registrar of trade unions, assistant deputy director general of manpower, and chief inspector of factories and shops, though his status in these positions (and the allowances attached) was confirmed only in January 1944. He remained in the linked positions, constantly haggling over acting allowances, until January 1947. After a further period acting in the top positions, he applied for permanency in September 1948, but was beaten by a man who had been his junior. His subsequent requests for the continuation of a number of allowances that had been paid to him when acting in the senior positions, and later entries in Who’s Who, in which he reported himself as the ‘Chief Inspector’, suggest a man confident in his own ability but thwarted in his reasonable ambitions by those less able, a theme to be repeated later in his senatorial career. Benn’s election to the Senate in 1949 took place in circumstances that gave him some discomfort. Provisions in the Australian Constitution and Commonwealth Electoral Act required that he relinquish his position in the public service before the close of nominations on 14 November. This he did, on 11 November. The election results of 10 December gave Benn his seat in fourth place for the state as a whole, behind Benjamin Courtice and two coalition members, and ahead of Gordon Brown. With his service not due to commence until 1 July 1950, Benn filled in the intervening time between his election and taking up his seat with employment as a shopwalker in a department store, an occupation that he already knew a lot about as a former shops inspector. Benn entered the Senate with his views well formed, joining two stalwarts of the Queensland labour movement, Brown and Courtice. Both were considerably older than Benn and, by that time, had already amassed thirty years of Senate membership between them. Each maintained his seat across most of Benn’s three terms, Courtice retiring in 1962 and Brown only in 1965, so that Benn was flanked for the greater part of his career by those who might have been thought to be his seniors. In fact, though, Benn showed his weight within the Queensland party by displacing Courtice from the top spot on the Labor ticket for the 1955 election; he retained that position in 1961. From the outset Benn showed no sign of being overawed by Brown or Courtice in the chamber. He made only slight reference to them in debate, also ignoring most other senators, at least in public, to judge from his almost complete absence of contributions to valedictory speeches and his dismissive responses to interjections. Other senators seem to have resigned themselves to his long and detailed contributions. The few members to whom he did pay tribute were from the other side, including W. H. Spooner, briefly, for having expedited a visit to the Snowy Mountains Hydro-electric Scheme, and, more expansively, F. A. Bland, a member of the coalition in the House of Representatives who had been chair of the Public Accounts Committee during Benn’s membership of it. Benn’s service on parliamentary committees was relatively extensive, though not quite as significant as the public record might indicate. In 1951 the Menzies Government reintroduced legislation on the Commonwealth Bank Bill in the hope that it would lead to a double dissolution of both houses, at which subsequent election Labor would be expected to lose. The Labor majority in the Senate retaliated by despatching the bill to a select committee of which Benn became a member. This was his first appointment to a select committee, but it was short-lived. On the grounds that the appointment of the committee constituted a failure to pass the legislation, Menzies and his Attorney-General, Senator Spicer, went to the Governor-General and secured a double dissolution. The loss of Labor’s Senate majority at the subsequent election in April inevitably changed the nature of Benn’s Senate career. The select committees on Canberra (1954–55) and on metric weights and measures (1967–68), however, delivered substantial reports, and the latter committee’s minutes of evidence show that Benn played a significant part in questioning witnesses during the committee’s hearings on the proposed currency reform. While at first something of a sceptic, by the end of the hearings he had become an enthusiastic proponent of metrication, supporting the committee’s recommendations, which proved to be unanimous. Benn probably drew most satisfaction from his membership of the Public Accounts Committee (1956–63), though not because he figured as an especially active member of it; rather, he is remembered as a brooding presence who needed to be prompted to ask questions. He did, however, serve for eight years on the committee and drew extensively from its reports in his speeches in the Senate, and even more extensively from the reports of the Auditor-General that the committee examined. He intervened often on the estimates and appropriation bills and the frequency of his references to the findings of the Auditor-General on ‘unsatisfactory’ matters, a word he frequently dwelt upon, were certainly without equal. In the chamber, Benn was a determined speaker. He was, as he claimed, ‘a man who [was] not easily defeated on any matter’. He spoke to the full length of time generally allowed for speeches in his period (one hour) and resisted calls to be brief. On one occasion he argued that no senator ‘should be made to feel … that he is under pressure as far as time is concerned’. He pronounced: ‘Arrangements made between the leader of my party and the Government are not my concern, and I am not a party to them … if I am not informed of the arrangements beforehand I have no intention whatever of observing them’. It was true enough, as later remembered by a successor, that he spoke chiefly on economic issues, but his range was wider than that. As a Queenslander, he defended the industries of his state strongly, especially the primary producing industries, often pointing to the employment that they generated. It was probably not boastful of him to say: ‘No honourable senator in the chamber knows more about employment matters than I do’. He thus defended some unlikely allies, such as graziers: in Queensland, ‘many thousands of workers depend upon the pastoral industry for their livelihood, and it behoves me to do what I can to protect that industry’. He defended the tobacco industry, criticising the quality of imported leaf from his own experience: if he smoked ‘five or six English Rothmans’, he had ‘a cough that is equal to the bark of an Alsatian’, but he could ‘smoke the Australian-made cigarettes indefinitely and never get a cough’. His ‘favorite topic’, he said, was ‘the manufacture of materials for use in the building industry’ and he spoke frequently to housing standards and to the need to improve workers’ housing, on one occasion making a point by crumbling an insect-ridden piece of wood onto the floor of the Senate (assuring members that it no longer contained ‘borers or borers’ eggs’). He was, it might seem, unabashedly a Queensland chauvinist. At the same time, Benn ranged widely into foreign affairs and made five international visits as a senator. Four of these were as a member of delegations: to the 11th session of the United Nations General Assembly in New York in 1956; to the 51st annual conference of the Inter-Parliamentary Union in Brasilia in 1962; to South Asia in 1966; and to the 13th Commonwealth Parliamentary Association conference in Uganda in 1967. He spoke frequently to issues of governance in Papua New Guinea (PNG), where he claimed to have lived for a period, and which he visited on several occasions including as a member of the select committee on metrication. He sent notes on one of these visits to Paul Hasluck, who in turn sent them to the Acting Administrator of the Territory. Subject matter included agriculture, the sale of liquor to Asiatics and the establishment of a secondary school. The development of PNG—which he thought should not be unduly hastened—was the theme of his speech during his visit to Brasilia, and of a number of speeches in the Senate. Benn’s political philosophy was not quite that expected from one of his background, as he often displayed attitudes found on the left of the party. He was a loyal supporter of the AWU and was reported to have clashed fiercely with Premier V. C. Gair during Gair’s dispute with the union in 1955, differences that may have had a personal dimension. (Gair had been Minister for Labour and Industry during Benn’s final period in the Queensland Public Service, and the pair seem to have ignored each other completely in the chamber after Gair’s entry as a senator in 1965, a family member recalling that Benn hated Gair.) Strongly critical of the American alliance, ‘Australia is on the American band-wagon … a little chick following the American hen’, Benn postulated that communism in Asia was the inevitable outcome of poverty, frequently asserting that the policies of the Menzies Government promoted unemployment and would produce the same result in Australia. He speculated that within ‘a few years, perhaps China will be the master of Asia’, and feared that a ‘political militaristic caste will govern Japan again’. He was suspicious of foreign investment and took a close interest in the concentrated ownership of television and radio stations and of the airlines, often reporting profuse details of share ownership and balance sheets to a bemused Senate. Despite the detail, his speeches were always vigorous, leading one opponent to condemn his ‘extravagant, outrageous and irresponsible language’, which revealed him as a ‘hater of private enterprise’. Benn denied that charge, but undoubtedly he had an acute sense of the injustices of class and privilege, as revealed in a typical passing remark when condemning sales tax: ‘One seldom sees the child of a wealthy family playing a mouth organ. Such children have pianos’. Though later reported to be an outright opponent of immigration, likening migrants to cane toads, his attitudes showed some nuance. He was less an opponent of immigration than an advocate of the careful settlement of migrants. In 1951 he declared immigration to be ‘a good thing’, though at that time he thought it ‘should be suspended for twelve months’ because of its adverse impact on employment. His notorious reference to cane toads turned on the point that ‘all the toads went into the townships’ where there were ‘electric lights, [and] they could get their meals without going out and catching beetles in cane crops’. Australia was, he said, ‘having a similar experience with migrants’ and it would be better if they were forced to work in the country. He was also heterodox in his social attitudes, defending the ‘bodgies’ and ‘widgies’ of the time from attacks in the popular press, pointing out that shopkeepers made profits from selling their colourful clothing. Benn acted briefly as Leader of the Opposition in the Senate when N. E. McKenna was ill in October 1957, and served as a temporary chairman of committees (1962–65, 1967–68), but was never a likely aspirant for higher office. He was a self-contained man, with a bent of humour that others often found rather ponderous. Benn’s closing days in the Senate were inglorious due to remarks that might have been intended as humorous but were not so interpreted by his peers: his suggestion that Senator Cormack should be tested for sobriety each day at 8 p.m. with a breathalyser led to his suspension for a day on a unanimous vote, the President of the Senate terming his language ‘highly disorderly … offensive and without basis in fact’ and regretting that it would ‘almost certainly be referred to in broadcasts and in the Press’. Indeed, cries of ‘shame’, ‘vicious old man’ and ‘throw him out’ were so reported. Benn refused to apologise or withdraw his remarks when invited to do so. As one of his opponents put it a few days after his ejection, he was ‘a dour type … who is never frightened to speak up for what he thinks is right’. A speaker from Benn’s side said much the same: he had ‘a highly individualistic streak in his character’, and was ‘a man of very strong opinions which he was never afraid to express’. Benn had married Margaret Willey on 19 April 1924 in St Stephen’s Presbyterian Church, Toowoomba. The couple had one son. Margaret died on 7 May 1929, and Benn married Frances Clara Pegus on 20 October 1934 in St Stephen’s Catholic Cathedral, Brisbane. From this marriage there was a daughter and a son. Benn lived quietly after his retirement from the Senate and took no notable part in public affairs. He died on 3 April 1980 at Paddington, Brisbane, and was privately cremated following a Requiem Mass at St Patrick’s Church in Fortitude Valley. The author acknowledges the assistance of Frank Benn; Herb Steinohrt Papers, UQFL 343, box 5, Fryer Library, UQ; Australian Workers’ Union (AWU), Qld branch, South-western district, Membership rolls, 1919–20, E161/52/xv, NBAC, ANU. AWU, Qld branch, Annual delegate meeting, Official reports, 1919, 1922, M50, reel 1, NBAC, ANU; Benn, Archibald Malcolm, Personnel file, item ID934898, QSA. Benn, Personnel file, item ID934898, QSA. Memorandum, W. G. Hamilton, Solicitor-General, to the Public Service Commissioner, 22 June 1949, Benn, Personnel file, item ID934898, QSA; The editor is indebted to Frank and Jocelyn Benn. CPD, 20 Oct. 1954, p. 898, 10 Mar. 1960, p. 85. Gavin Souter, Acts of Parliament, MUP, Carlton, Vic., 1988, pp. 417–18; CPP, S2/1955, 19/1968; The author is indebted to P. H. Bailey, former secretary, Joint Committee on Public Accounts; CPD, 24 Oct. 1956, pp. 871–3. CPD, 13 Oct. 1966, p. 1060, 25 Sept. 1958, p. 663. CPD, 16 Apr. 1980, p. 1459, 31 May 1960, p. 1225, 14 Nov. 1951, p. 1957, 10 Oct. 1962, p. 746, 25 Sept. 1963, p. 829, 24 Feb. 1959, p. 159. CPD, 9 Apr. 1957, pp. 382–92, 11 Oct. 1960, p. 996; Administration—Senator Benn—Recommendations as a result of visit to Papua and New Guinea, 1952–53, A518, CA800/1/7, NAA; CPP, 160/1963; CPD, 21 May 1963, pp. 588–92. Clem Lack (ed. ), Three Decades of Queensland Political History 1929–1960, Government Printer, Brisbane, 1962, p. 432; The author is indebted to Frank Benn; CPD, 5 Mar. 1952, pp. 816–17, 6 Sept. 1956, p. 163, 28 Feb. 1952, p. 512, 27 Aug. 1963, pp. 216–17, 31 May 1960, pp. 1170–5, 5 Nov. 1952, pp. 4192–5, 21 Nov. 1957, p. 1430, 27 Nov. 1951, p. 2747. J. W. Knott, Events and issues that made the news in 1952, NAA, viewed 25 Feb. 2009, <http://www.naa.gov.au/collection/explore/cabinet/notebooks/events-issues-1952.aspx >; CPD, 13 Mar. 1951, p. 315, 20 June 1951, p. 116, 9 Oct. 1952, p. 2769, 25 Aug. 1959, pp. 279–81. CPD, 9 May 1968, pp. 902–3, 936; Age (Melb. ), 10 May 1968, p. 7; CPD, 13 June 1968, pp. 1804, 1806. The author is indebted to Jocelyn Benn; Courier-Mail (Brisb. ), 9 Apr. 1980, p. 41. This biography was first published in The Biographical Dictionary of the Australian Senate, vol. 3, 1962-1983, University of New South Wales Press Ltd, Sydney, 2010, pp. 280-285.